You want to have your wedding or elopement in Palm Springs, right? But the desert/windmill/hotel thing has been done, and you’re looking for something unique–something that speaks to both of you. Think rustic. Think romantic. Think ranch–Lazy C Ranch, to be exact. Getting married is a pretty big deal. Wedding planners tirelessly prepare for the big day, wedding guests show up to celebrate the union of the wedding couple, and the wedding couple looks amazing despite being teary and happily nervous. With all the planning and emotion that goes into a wedding, you generally don’t want weirdos to photo bomb your wedding pictures. We now present to you 10 exceptions to this rule. Here are the 10 best animal photo bombs ever to happen at weddings. This couple who didn’t feel at all cooped up in present company. This dog who just wants in on the love. And this. This creeper llama. When we met this couple, they told us they wanted their elopement to be simple, yet special (don’t we all?). After their first visit to Lazy C Ranch, they fell in love with the mountains, the animals, and the rustic details of the ranch that set it apart from the typical Palm Springs vibe. Here are some of our favorite elopement photos from their special day. Photography by Lola Melissa Photography (lolamelissaphotography@gmail.com), Styling and Makeup by Isabel Macias (isabelmaciasmua.com), and flower crown provided by Vaso Bello (www.vasobello.com). Shot on location at Lazy C Ranch (www.thelazycranch.com). Renowned as one of the greatest sandwich/sub joints in Palm Springs, The Sandwich Spot offers a casual dining environment for sandwich lovers of all ages. Even though The Sandwich Spot has locations throughout California, there are only three places to grab these popular sandwiches in Southern California. So unless you want to trek to Encinitas or Simi Valley, your best bet is to enjoy a delicious Grand Slam, Gene Autry, or Dreamkiller right here in Palm Springs. Sherman’s is a comfy, old school family style diner. Whether you go for sweet or savory, everything on the menu is hearty and tasty. With some of the friendliest staff in the Coachella Valley, your whole family will have a good time, and you can relax and let the kids be kids. Pro tip: leaving room for dessert is a must! Sunday Funday is taken care of at Cheeky’s. This place is a hit with the brunch crowd, so it can get busy on weekends, but it’s completely worth it–trust us. Their menu changes weekly, so even locals stay excited about the eclectic American cuisine (bacon remains an evergreen favorite). Most of the food is organic, locally sourced, fresh squeezed, and so on. Oh, and they’ve got the best mimosas you’ve ever had. Workshop Kitchen + Bar is easily one of the trendiest restaurants in Palm Springs, and is perfect for couples or large groups. As the name implies, the establishment offers dining as well as a small, back of the house bar with novelty and classic cocktails. Tucked away in a courtyard that is removed from the street, Workshop offers outdoor seating for guests who want to enjoy the desert’s crisp night sky. But wait until you get inside–neutral minimalism, boastful industrial construction, and floor to ceiling booths make this restaurant one of the most uniquely designed locations we’ve ever seen. Even the serving staff (which is beyond excellent, btw) is outfitted in what appears to be designer unisex workshop overalls. Always, always ask about their specials. Ideal for special occasions, Le Vallauris is easily the best French restaurant in Palm Springs. The menu consists of traditional French fare prepared by highly trained chefs, and the classically designed dining room and outdoor patio add to the establishment’s elegance. The impressive wine and cocktail lists aren’t bad, either. We love Le Vallauris for romantic evenings, anniversaries, and group celebrations. New American cuisine, wood-fired pizza, and craft cocktails combine with second floor patio seating to make this restaurant an excellent choice for casual yet stylish dining. Matchbox’s mid-range price point is suitable for groups of all sizes looking to share plates of delicious food and great conversation while enjoying peaceful views of Palm Canyon Drive. More couples are turning to Elopement ceremonies in lieu of large, traditional, (and sometimes expensive!) weddings. Palm Springs is a favorite destination for couples, because it’s the perfect place for both the ceremony and the honeymoon. Lazy C Ranch offers a host of wedding packages for couples. 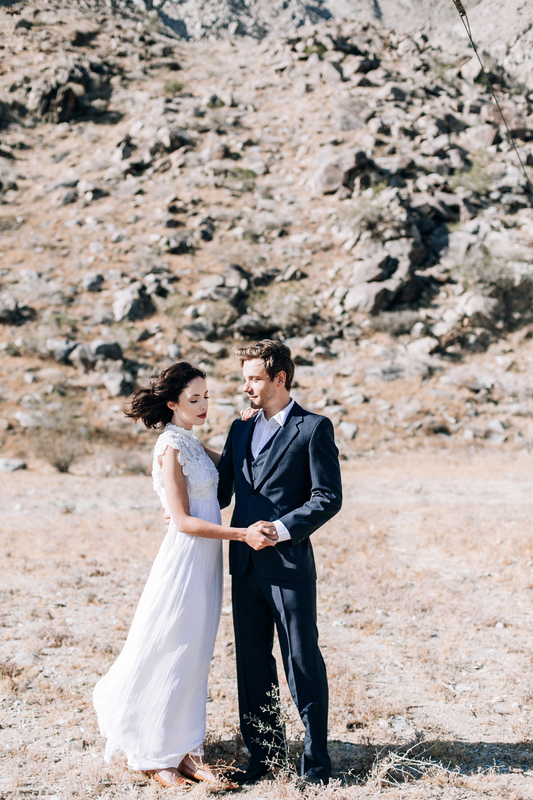 From engagement shoots to elopements, larger weddings and after parties to vow renewals, our rustic Palm Springs ranch lets you see another side of the desert while sharing your day with your loved ones. Nicole and James held an intimate Elopement ceremony with a few friends and family members at Lazy C Ranch, then honeymooned with us for a week. And we have to say, the photos from their couple’s shoot is absolutely gorgeous. Shot at Lazy C Ranch Palm Springs, CA. Headed to Palm Springs with the kids? Lazy C Ranch has the lowdown on the best kids places in Palm Springs. Read on to find the perfect activities for your little ones to accompany your stay with us at the ranch! One of the most popular attractions for Palm Springs visitors, the Palm Springs Aerial Tramway is a delight for children and adults alike. This tram takes you on a stunning two and a half mile ride up the San Jacinto mountains. Your kids will never forget the breathtaking views and serene surrounds of this mini journey. Operation times vary, so be sure to check the website or give them a call to confirm your trip up the mountain. This classic roadside attraction is a must for families visiting Pal m Springs. The Cabazon Dinosaur Museum features the biggest dinosaurs in the world (don’t quote us on this, but suffice it to say your kids will be impressed). Whether driving in or driving out, this beloved dinosaur attraction is the perfect opportunity for a fun family photo. Forget the high-end golf courses in Palm Springs–opt for mini golf instead! Locals and visitors alike love running wild at Boomers Amusement Park, which is one of the most exciting kid-friendly attractions in Palm Springs. Enjoy miniature golf, go-karts, rock climbing, water sports, and more. It’s always a good idea to plan for a cool indoor activity during hot Palm Springs weather. Located just a short drive from Palm Springs in Rancho Mirage, this children’s museum is fun for all ages and is a great choice for an adventure-filled day inside. Your family will love the freedom of the kid-oriented exhibits and casual atmosphere.